KABUL– A key conference on corruption in Afghanistan ended Thursday with delegates suggesting the government end immunity for corrupt officials and intensify the fight against graft. The forum drew about 450 people -- cabinet ministers, ambassadors, judges, lawyers and anti-corruption officials -- to discuss how to fight the endemic corruption that is paralysing Afghanistan's development. President Hamid Karzai, who called the conference, is under intense pressure from his Western backers to cure the corruption infecting his administration in return for billions of dollars in military and development assistance. Karzai, who was re-elected in August in a vote marred by massive fraud mostly in his favour, used the meeting to warn that reform would take years. The president used his inauguration speech last month to pledge an end to corruption. He is expected to announce his cabinet within days, the first test of his commitment to his backers to usher in an era of clean government. The gathering discussed different aspects and causes of official corruption, said Mohammad Yaseen Osmani, the head of the Karzai-appointed High Office of Oversight and Anti-Corruption, speaking as the three-day meeting closed. The government must put a stop to the practice of "protecting corruption by political groups, officials and influentials," said a resolution from the conference which also included calls on the state to encourage accountability in its institutions. The resolution also urged the government to lift "illegal immunity for corrupt officials" and "punish those who lobby for them." It said officials should be held responsible for the quality of their work and failure to provide basic services. Respecting the independence of the judiciary, publicising "significant convictions" of corrupt officials and establishing complaint centres were other suggestions to emerge. Karzai will use the recommendations in his fight against graft, a participant who asked not to be named told AFP. The United States, Afghanistan's key backer, has warned Karzai to back his words with action or see his cabinet bypassed in favour of lower-level officials. Improving government service in order to bolster public support for the Karzai government is a pivotal part of a new US war plan which includes deploying 30,000 extra American troops to fight a resurgent Taliban insurgency. Karzai opened the conference on Tuesday with an expression of support for the mayor of Kabul who was sentenced to four years in prison by an Afghan court for wasting public money. "We must be cautious that the campaign against graft does not itself turn into corruption. A few days ago the Kabul mayor was sentenced to four years in prison. I know the mayor of Kabul, he is an honest person," he said. An Afghan court found Mir Abdul Ahad Sahebi guilty of wasting around 16,500 dollars of public money after hearing one of a string of corruption, embezzlement and misuse of power cases pending against him. Last month, Afghanistan formed a new crime unit to investigate and prosecute major corruption and Karzai is preparing for an international conference in London next month due to tackle the issue. The High Office of Oversight and Anti-Corruption, set up about a year ago, has been hampered in its work by inadequate laws. The Special Inspector General for Afghanistan Reconstruction, a US government watchdog, said in a damning report published Wednesday that the office is hamstrung by a lack of trained staff, enforcement powers and independence. Two of Afghanistan's top ministers have been cleared of corruption charges just hours after appearing on a list of government ministers deemed corrupt by the country's attorney general. The deputy attorney general said the foreign and interior ministers' names had been included on the list presented to the Afghan parliamant on Thursday because of a "sense of miscommunication". "The prosecutors office originally said Hanif Atmar, the interior minister, may have tampered with his CV ... and they were concerned about the legitimacy of his university qualification," said Hashem Ahelbarra, Al Jazeera's correspondent in Kabul. "But now they are saying it was a bonafide CV and a genuine university diploma. He is cleared from the list." Rangin Spanta, the foreign minister, who was accused of wrongdoing, was also cleared. Ahelbarra said there was a string of evidence against two other ministers, but the deputy attorney general did not elaborate. The list, released on the final day of a three-day anti-corruption conference, originally included 15 former ministers, five ministers currently holding positions and six governors in Afghanistan. The conference, the first official act by Hamid Karzai, the Afghan president, since he was sworn in for a second term, was convened after calls from his Western backers to make the country's government more transparent, particularly in the wake of the fraud-tainted presidential poll that took place in August. "This is going to have an impact on the future of Afghanistan," Ahelbarra said. "We will have to wait for another 48 hours for Karzai to announce the final make-up of his government, to see whether he is hearing calls from the international community and the Afghan people to sanction those involved in bribery and kick-back schemes. "However, his rivals are saying he will use this list to sanction those who endorsed doctor Abdullah, his election rival." Daoud Sultanzoy, an Afghan member of parliament, told Al Jazeera, the list leaves a lot of room for political influencing and agendas. "There is a lot of international and domestic pressure for Karzai to stamp out the endemic corruption in this country," Sultanzoy said. "However, this pressure can create a very zealous approach, we have to make sure we don't malign those who are being hunted for political reasons." WASHINGTON- The anti-corruption body formed by Afghan President Hamid Karzai suffers from "serious shortcomings" and lack of independence, with its top staff also serving as advisers to Karzai, said a U.S. audit on Wednesday. 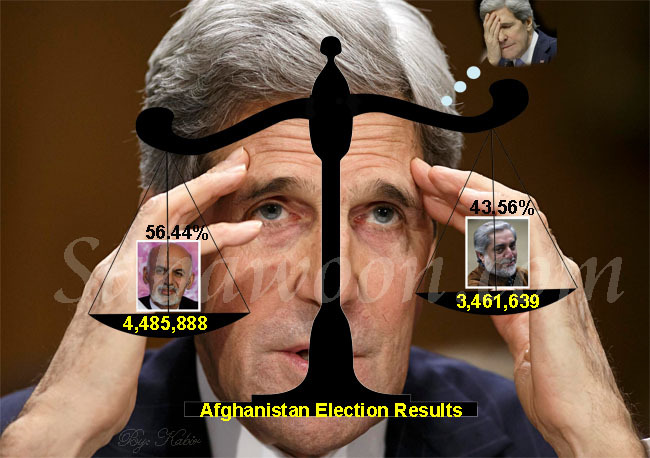 The audit by the Special Inspector General for Afghanistan Reconstruction, was harshly critical of the High Office of Oversight, or HOO, established in July 2008 by Karzai to oversee and coordinate efforts to fight corruption, which is seen by Washington as fueling the insurgency in Afghanistan. The report said the anti-corruption institution was hugely understaffed and lacked the organizational and budgetary independence to be an effective oversight body. "The HOO suffers from serious shortcomings as an institution both in terms of its operational capacity and the legislative framework on which it is based," said the report." Corruption is seen as pervasive and entrenched in Afghanistan, which the watchdog group Transparency International ranked as 179th out of 180 on its annual corruption index this year. Washington has made clear that fighting corruption must be a priority for Karzai in his new term and has cautioned him against putting "cronies" in important posts. But the audit said the "personal independence" of both HOO's director-general and deputy were impaired because they also served as advisers to Karzai, who was re-elected following a fraud-marred August election. "I believe that holding two government positions simultaneously, compromises the independence of the HOO and can, and in this case does, create a conflict of interest," said Arnold Fields, the Special Inspector General for Afghanistan Reconstruction, or SIGAR, whose role is to oversee U.S. taxpayer funds spent in Afghanistan. The report said both officials should resign either their HOO posts or their advisory positions for Karzai, whom they met with frequently before the election. "HOO leadership may have been distracted because of the 2009 election," said the report, adding that one "knowledgeable" official noted the deputy director-general had often acted as Karzai's speechwriter. So far, the Afghan anti-corruption oversight body had received about $1 million in U.S. funds to cover start-up costs, said the report. It is also set to get a further $7.3 million from the United Nations Development Program. "With this money, the HOO has undertaken anti-corruption efforts with varying degrees of progress," said the report. Citing other impairments to the HOO's independence, the report said its operating budget was administered by the Afghan government. Another problem was staff shortages. Of the 500 employees in the body's organizational chart, only 20 percent -- or 100 -- of those positions were filled.